Widely respected for centuries, colorful glass pieces from the island of Murano are well known throughout the world. This stunning heart-shaped bottle stopper is another example of Murano fine craftsmanship. 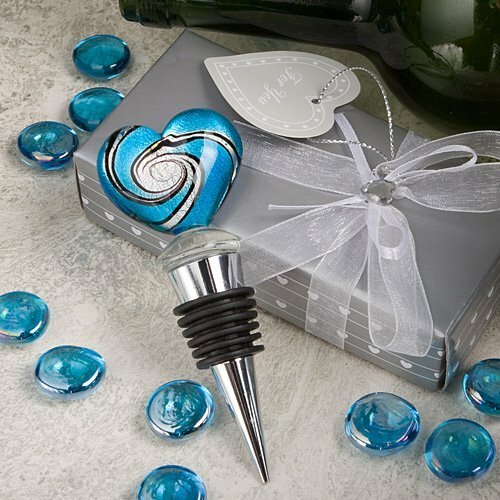 Each chrome-finish wine stopper measures 4" by 1 1/2" that has a cone-shaped base wrapped with a black rubber gasket and topped with a solid glass heart charm, hand painted in a swirl design with silver, black and blue. The wine bottle stoppers favors are nestled in a white satin-lined gift box with white organza ribbon, heart-shaped rhinestone charm and heart-shaped "For You" tag. 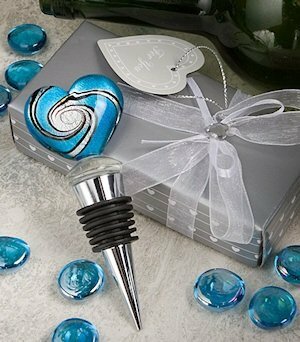 I am interested in the Blue Murano Heart Wine Bottle Stoppers Favors but I don't need them wrapped. Is that possible and if so, would the price be less? Unfortunately, we're unable to alter the Blue Murano Heart Wine Bottle Stoppers Favors from how they're described/shown on our site, as they're shipped directly from the manufacturer. Does the Blue Murano Heart Wine Bottle stoppers come with the box? Do you have a picture of the front of the box? Yes, the Blue Murano Heart Wine Bottle stoppers include a white satin-lined gift box with white organza ribbon, heart-shaped rhinestone charm and heart-shaped "For You" tag. Unfortunately, we don't have a photo of it, only the one shown on our product page-- but you can order a sample to see how it looks.